As leaders we must be open to God speaking to use through our experiences. Experiences range from miracles, signs and wonders, to trials and tribulations, to simple anointed observation revealing God’s voice in our lives. Not all our experiences are God speaking to us-- no, no, no! 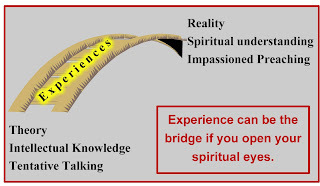 But many experiences serve as a bridge from the natural to the supernatural if our spiritual ears are tuned to hear, and our spiritual eyes focused to see. As a leader, your experiences serve as a bridge from theory to reality, from intellectual knowledge to spiritual understanding, and from tentative talking to passionate preaching. The people you lead know you’ve been there! You preach the Scripture more passionately about the Word you have experienced. You testify more ardently about healing if you have experienced healing. John said, "We proclaim to you what we have seen and heard" (1 Jn.1:4). Experiences can be the tangible, personal reality of Jesus in your life, your ministry, and your relationship with the Father. You must be tuned in. You must be aware. You must live through your spiritual eyes and ears to hear His voice through your experiences.